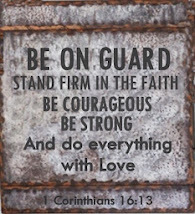 1 Corinthians 16:13-14 Be on your guard; stand firm in the faith; be courageous; be strong. Do everything in love. 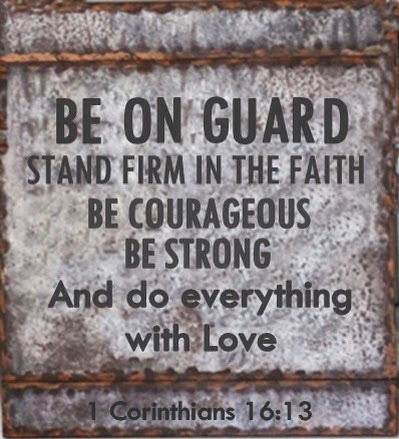 What I love about this verse is the all encompassing attitude that it encourages. Alert, stable, courageous and strong: what a powerful 4-pack! Stand your guard and stand your ground. Use the strength of the Lord to boldly move forward. And do ALL of this in love! My prayer for you today is that this posture and power would overwhelm you so that you can have influence for Jesus in this world. As a follower of Jesus you have a mission to make more followers. Just do it! And remember, do everything in love!